Thanks Melbourne Minor for guest blogging for us today at the Jurassic Creatures feat. Prehistoric Creatures of the Ice. Looks like the minis and Harry the T Rex had a great time! For more details, go to the Jurassic Creatures' website. Today was the day the dinosaurs arrived at Harbour Town for the Jurassic Creatures experience. 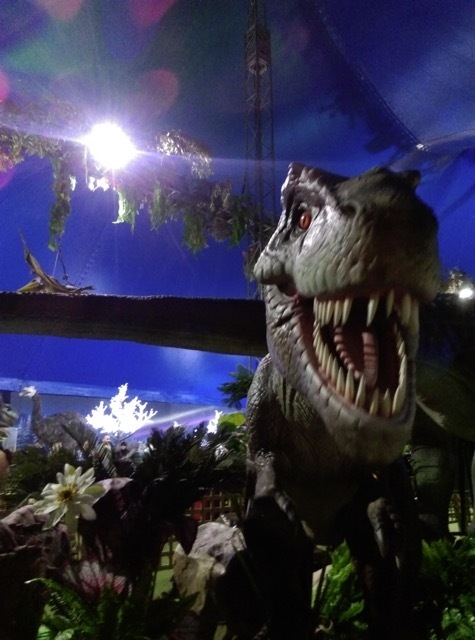 You'll be needing a dinosaur expert to review this event so we took Harry the T Rex with us who checked everything out first thing this morning. 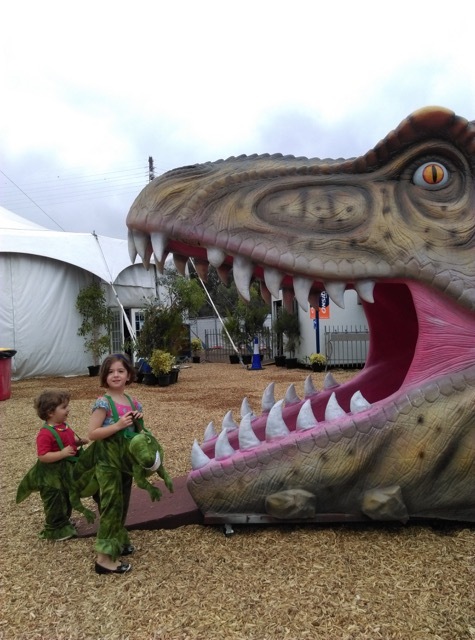 The main tent is where the Dinosaur action is with the Dinosaur Train Show up the back, a jumping castle, carnival games and some interactive activities. There is a paleontologist dig, magic sand pit and dinosaur sand art. Harry liked the snow machine that was keeping all these critters cool. The rides are just outside (behind the gift shop) and are all included in your ticket. The dinosaurs outside are your best bet for photo ops as you can get up closer and it's not dark. 1. Visit the rides first to avoid lines. 2. Bring the umbrellas in poor weather, the event is undercover but the line to get in is out in the open. 3. Save time, get your tickets online. 4. For free parking visit on a Sunday when there is free 2hr street parking. 1. This is a very loud and busy event, sensitive dino ranglers best steer clear. 2. The rides are outside so will be impacted by bad weather. 3. Long term dinosaur fans, like us, will recognise a lot of the entertainment from the school holidays shopping centre circuit. 4. Carnival games are at an additional cost. 5. No Chris Pratt. At all. Harry and his dinosaur crew really enjoyed their morning at Jurassic Creatures, it was a great way to prepare for the Jurassic World Exhibition at Melbourne Museum next week!